Published: June 28, 2013 at 01:03 p.m. Updated: July 1, 2013 at 04:47 a.m.
Carlos Ortiz, arrested Wednesday in connection with the murder charge facing former New England Patriots tight end Aaron Hernandez, was charged with possessing a weapon without a license during his arraignment Friday at Attleboro District Court in Massachusetts. Ortiz will remain in custody until July 9, when he will have a "dangerousness" hearing. Ortiz's attorney will request bail at that time. Bristol County District Attorney C. Samuel Sutter said in a post-hearing news conference that additional charges related to the death of Odin Lloyd might be filed against Ortiz at the July 9 hearing, NFL Network's Randy Moss reported Friday. During a Friday morning hearing, a judge in Bristol, Conn., ordered Ortiz turned over to Massachusetts authorities, The Associated Press reported. The 27-year-old Ortiz was charged in Connecticut as a fugitive from justice, per the AP. 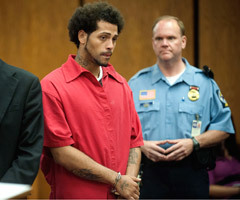 Ortiz was being held on $1.5 million bail in Hartford after waiving extradition to Massachusetts. The North Attleboro Police Department also confirmed Friday that it has located and recovered the silver/grey Chrysler 300 that police had been looking for in connection to the Lloyd investigation. The car previously had last been seen operated by Ernest "Bo Fish" Wallace, 41, whom authorities said was wanted as an accessory after the fact in Lloyd's murder. Wallace turned himself in to Miramar (Fla.) Police at around 1:22 p.m. ET on Friday without incident, according to a release from the Miramar Police Department. Wallace told authorities he saw his name in the news and knew there was a warrant out for his arrest. The warrant was from the North Attleboro Police Department. "We believe we now have in custody the three individuals who were in the silver Nissan Altima at the time Odin Lloyd got into the car at approximately 2:30 a.m. (ET) on June 17," Sutter said. Hernandez on Thursday was denied bail in relation to the first-degree murder charge he faces in the Odin case. Odin was found dead in an industrial park near Hernandez's North Attleboro home at about 5:30 p.m. ET on June 17. On Friday, Bristol County Sheriff Tom Hodgson confirmed to NFL Network that Hernandez also is being investigated by the Boston Police Department in connection to a 2012 double homicide.